In this endearing story of a tiny toy train, the creator of the hit series Dinotrux now breathes life into more than a half-dozen trains that climb, haul, chug, zip, and zoom. In a small room, down a short flight of stairs, there lives a little toy train...about to have a BIG adventure! There's an endless world to explore, and awe-inspiring new friends to meet. Mighty Max, Chloe Cogs, Sara Speedster, and Farley Freighter can reach all the best sights, lickety-split. But when the day is done and the sun goes down, will the littlest train find his way home? Calling all train lovers: All aboard! Chris Gall is the award-winning author and illustrator of Dinotrux, a Publishers Weekly Best Children's Book which inspired a Netflix original TV series, and the other books in the series, including Dinotrux Dig the Beach and Revenge of the Dinotrux. His other picture books include Nanobots, Dog vs. Cat, Awesome Dawson, Substitute Creacher, and America the Beautiful, another Publisher's Weekly Best Children's Book. He lives in Tucson, Arizona. *"This well-plotted and suspenseful story of disruption, adventure, and hero's return will have massive appeal for all train lovers, as it showcases the steam locomotive, cog railway engine, bullet train, and freight train, not to mention a crowded switching yard. ... Being little has never been so grand." 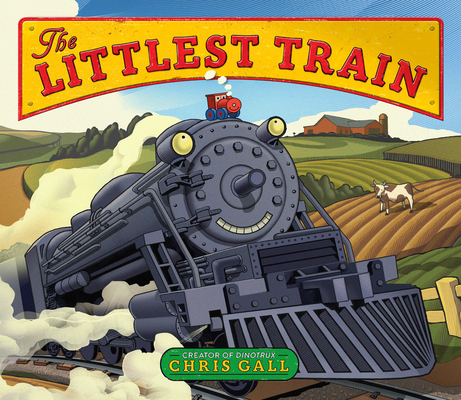 "Chris Gall combines the joy of toy trains with the muscular glamour of real ones.... Rich colors and clean, elegant illustrations add a touch of enchantment to this satisfying tale."